It has been one year since the original group of protesters showed up in lower Manhattan to speak out against economic inequality. NBC's Brian Williams reports. NEW YORK, Updated at 8:35 p.m. ET -- Looking to reignite their movement on its one-year anniversary, several hundred Occupy Wall Street activists protested in lower Manhattan Monday, staging a sit-in near the iconic New York Stock Exchange and swarming through the streets in costumes and toting American flags and signs. Police said more than 180 protesters were arrested, mostly for disorderly conduct. Earlier Monday, protester Michael Aaron said some religious leaders and dozens of others were arrested after sitting down in the street and on the sidewalk, blocking the thoroughfares. "We're just at year one. We have a really big mountain to climb. But we're hoping to get the power back to the people," said Kim Fraczek, 37, who wore an Obama mask. She was with a man, Erik McGregor, 44, who had on a Romney one. They said they were aiming to show the two were controlled by money. "In our bipartisan system, when the two candidates for presidency are doing everything to kneel down to the corporations and banks and turn against the people, it doesn't matter who you vote for, because the war machine will continue," said Fraczek, a handbag and jewelry designer. 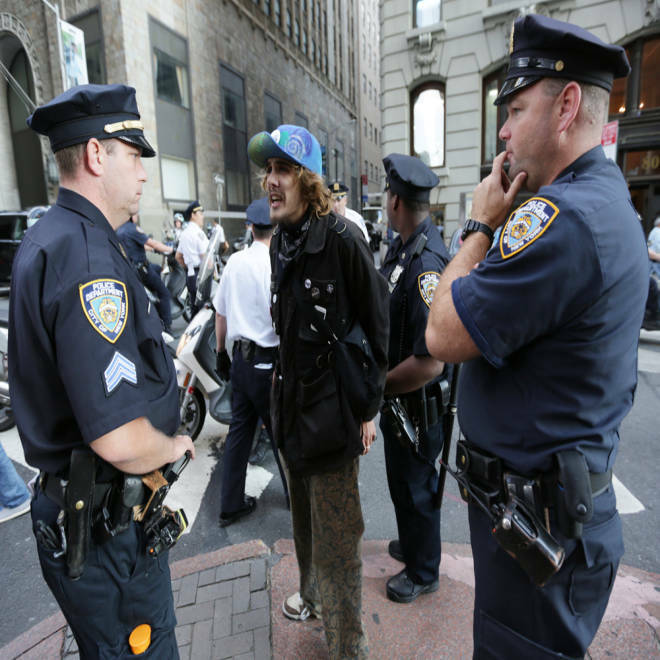 An arrest on Wall Street as Occupy protesters circulate through the financial district trying to disrupt business on Sept. 17. The early morning protests and marches were marked by festive cheer, with demonstrators throwing confetti and glitter, carrying balloons and singing "happy birthday." But some protesters also reflected a more somber tone on the anniversary of the day when they set up a nearly two-month camp in nearby Zuccotti Park to protest against income inequality, corporate greed and money in politics. "It's kind of a day of reflection, a day of celebration, a day that reflects some collective muscle and show of force. And I also think to remind not just ourselves but the world ... that things haven't really gotten better in the last year. In many ways they have gotten worse," said Ian Williams, 27, a graduate student at New York's Hunter College in social work. "And the project we're sort of embarking upon is a long term one." Protestors gather around the New York Stock Exchange on the one year anniversary of Occupy Wall Street. WNBC's Lori Bordonaro reports. At some points, protesters blocked traffic and there were a few skirmishes with police that NBC News staff witnessed. Many protesters wore costumes, such as a group who marched into a Bank of America dressed as polar bears and then formed a meditation circle with others in front of the bank. One of the protesters held a sign that read, "Wall Street: The Business of Extinction." Another group, clad in black, carried cardboard headstones painted white, with some reading, "RIP" or "Here lies." A woman leading the group had a sign that asked, "What is the cost?" "The one percent is dictating to the rest of us how we can live our lives," Wes Nickerson, a 59-year-old home health helper from Cambridge, Mass., said as protesters streamed by singing The Beatles' lyrics, "you say it's your birthday." Hundreds of protesters march in Manhattan's financial district on the one year anniversary of the birth of the "Occupy Wall Street" movement. CNBC's Kayla Tausche and John Carney report. "I had to come here today because the issues are pressing," he said. Ahead of the protest, Linda Brown, a retired teacher from Brooklyn, gathered with about 100 activists blocks from the NYSE preparing to join the larger sit-down. "I think what we have learned a lot in the last couple of years is that the financial crisis wasn't just an act of God ... it was brought about by a whole lot of criminality," said Brown, 66, who has been participating in Occupy since last October. "This is our democracy, it's really at risk," she added. "We're petitioning for redress of our grievances." Though Occupy Wall Street galvanized thousands of people across the country last year to protest against the abuses of what they called the "one percent," their numbers have dwindled amid internal squabbling, questions over leadership and financial transparency, and what critics called a lack of direction and goals. 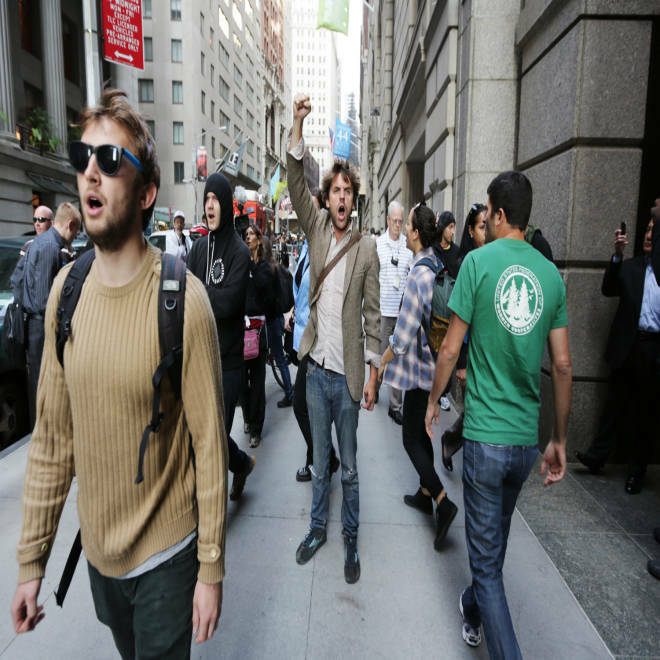 Occupy Wall Street protesters circulate throughout the financial district trying to disrupt business Monday. But they're hoping Monday will help put more focus onto their original concerns: corporate greed, income inequality and money in politics. “Why are we going back to Wall Street? Because the one percent wants it all and they’re not giving anything up without a struggle. Economic conditions are roughly as bad as they were a year ago and for many, many people they’re precarious,” said Bill Dobbs, of the Occupy Wall Street public relations team. What happened to Occupy Wall Street? Monday's demonstration will culminate three days of teach-ins, marches, a town square and other events in New York leading up to the anniversary. Occupy Congress: Could it be politics as unusual?